This is a quick and easy way to use up leftover chicken from a Sunday Roast. It doesn’t have to be chicken, turkey would do. Sometimes when I don’t have any left over roast chicken and I have a yearning for chicken pie, I just poach a chicken breast in a saucepan with some stock instead. Leeks give the dish a little lift whereas onions would overpower the chicken. They also give a little bit of colour too. I sometimes replace the leeks with a sliced red pepper. This is an easy recipe which can be played around with. I also like to cook my pastry separately on a baking sheet as I like the pastry crispy all the way through. This meal in some ways is a bit of a cheat because it can be put together very quickly. 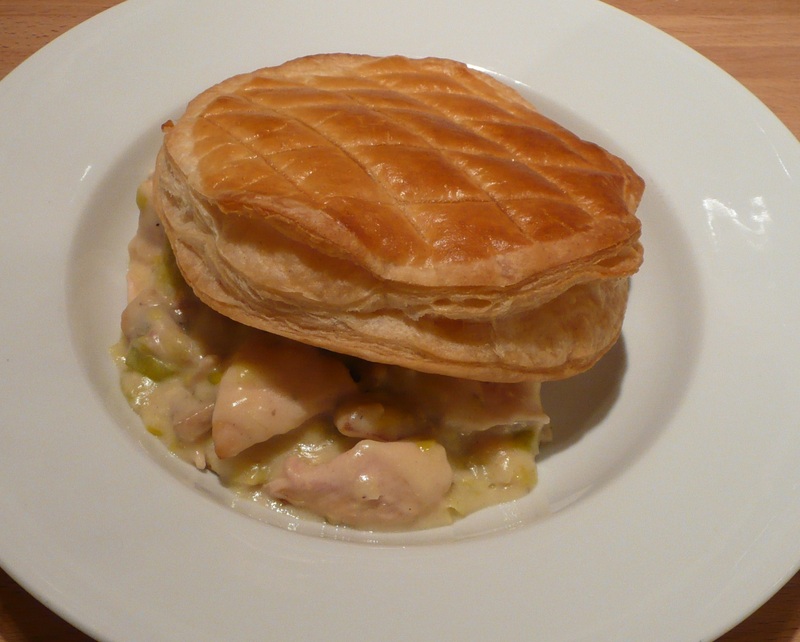 I used a rough puff pastry recipe but you can also use frozen or fresh pastry from the supermarket. Like everything else, homemade always tastes better. 1 Leek trimmed top and bottom, washed and chopped into discs. If you wish you could add sweetcorn to pad out the chicken. In a saucepan melt the butter then add the leek. Using a wooden spoon stir and gently separate the leek rings so that they cook uniformly. Do not let them brown you need them to soften. Add the flour and stir leave on a low heat for a few minutes so that the butter incorporates the flour and the taste of the flour is cooked out. Add the milk a bit at a time stirring continuously and bring to a gentle boil. The sauce should be custard like and smooth, if not take the pan off the heat and give it your best spoon action until all the lumps have been beaten out. If you want a looser sauce then add a little more milk. In another pan add a little butter or oil and fry your mushrooms. To keep their shape more cook on a medium heat. When coloured slightly remove and drain and add these to the sauce along with the chicken and mustard. Add salt and pepper to taste. Empty out into a pie dish and depending how you wish to cook your pastry either cover the dish with pastry or foil and place in the oven Gas mark 7/220c for 40/45 minutes. I put the chicken warm from the pan on the middle shelf and the pastry on a baking sheet on the top shelf. When the pastry has gone golden brown it is generally an indication that the pie filling is also done. As the chicken is cooked already all you are doing is fusing the flavours.